After her father loses one of his legs in an explosion, Obayda's family has to move to her father's village where there is family to help them. With her father in a deep depression, the family needs some good luck so Obayda's aunt suggests making her into a bacha posh - a girl dressed as a boy. 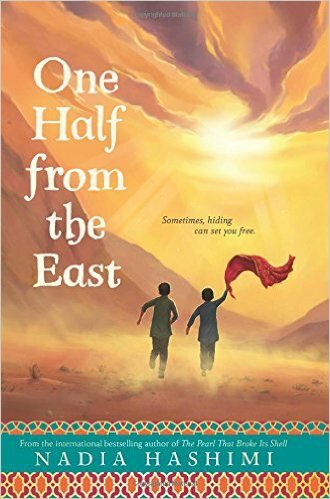 Girls in Afghanistan have to follow a strict set of rules so having a boy in the family will give them some options to help out while giving Obayda more freedom for a few years until she has to go back to being a girl. Within days Obayda cuts her hair, puts on boys' clothes, and becomes Obayd. She is confused about who she is and how to act like a boy until she meets another bacha posh who shows her how much freedom they have now. The two become best friends, wishing to never have to turn back into girls. But parents and society have other plans. I was completely absorbed in this book and compelled to do more research on bacha posh when I finished it a day later. Often, books set in other cultures are all about teaching us something important about that culture at the expense of the story. While the parts of Afghani culture were there, the story and Obayd's experiences were front and center. This book has been nominated for a middle school reading program in my county and I think the discussion about culture and gender will be fascinating! I have a couple of quibbles with the end where Obayda thinks that a couple of women she knows would've been good bacha posh because they are so strong - why do they have to be "boys" to be strong? - but that's a small thing and could easily be a reflection of the culture. Otherwise, I loved it.